This is a historic occasion as the Government of the Virgin Islands, through the Virgin Islands Shipping Registry as its key maritime administration arm, continues to move forward with purposeful resolve to make this area of our economy stronger and more vibrant. Over the past year and recent months the Government has made some key decisions that we believe will continue to open avenues for growth within the maritime industry of the Territory. The Virgin Island Shipping Registry is a member of the prestigious United Kingdom Red Ensign Group of Ship Registry. This group is renowned for quality and safety in maritime administration. Most recently, Cabinet has approved and I have signed a Memorandum of Understanding with the United Kingdom to empower the Virgin Islands Shipping Registry to operate as a full Category One Register of Ships within the Red Ensign Group. This means that the once fully executed, restrictions on the size and type of vessels which are allowed to be registered under the flag of the BVI will be removed. The VISR will be able to offer their services to a wider market internationally. We are steadily moving forward in ensuring that we are compliant with international maritime law. 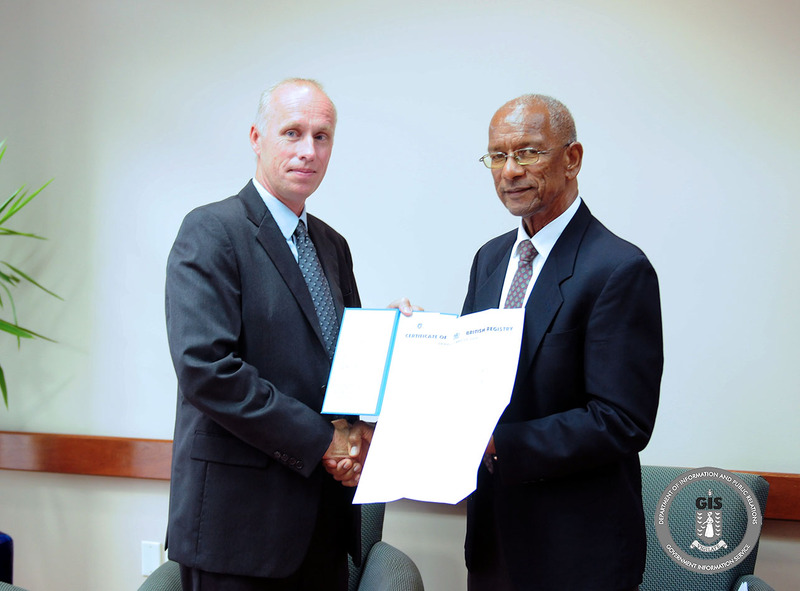 The process of enacting the Maritime Labour Convention into BVI law is afoot. This convention said to be the “Seafarers Bill of Rights” deals with the Seafarers Living and Working conditions. Some of you may be aware of a recent public seminar held by the Shipping Registry to inform the public and industry stakeholders, how the law will affect them individually and as maritime service providers. We are also working on amendments to Merchant Shipping legislation to make it fit for purpose for the shipping registry to face the emerging challenges in the industry. Marketing the Virgin Islands Shipping Registry is key to increasing the growth of the number of ships registered in the BVI. In 2014, 234 ships were registered in the BVI, and I am pleased to report that this year, up to mid-August, 166 ships have already been registered. The VISR has over 3750 vessels in their register consisting of mostly yachts and tugs. However, as a full Category One register, the Territory will be in a position to enter the larger ships market. Furthermore, in our continued efforts to be responsive to our clientele, particularly in the European market, this year my Government opened a London Office of the Virgin Islands Shipping Registry and placed a Business Development Manager to market the registry, respond to clients in the UK and EU sector, as well as attend to their survey, certification and registration needs. I am also very pleased to announce that the Shipping Registry has joined the Red Ensign Group Joint Marketing Forum. This forum will have a strong presence in the London International Shipping Week in early September this year where a unique networking opportunity for leaders across all sectors of the international shipping industry is available. It is anticipated that the VISR delegation will meet with some of the shipping industry biggest players and will take the opportunity to emphasize the advantages of doing business with the BVI. In addition, the Virgin Islands will have a strong presence at the upcoming Monaco Yacht Show slated for September 23-26. This is an annual event that showcases the expertise of the super yacht industry in their respective fields. The show is expected to have its usual presence of shipping registries, yacht owners, designers, ship yards and providers of ancillary maritime services. This show is largely attended by people of high net worth who own super yachts. Along with promoting our shipping registration services the Virgin Islands Shipping Registry of the BVI booth will also showcase the Territory as a destination of choice for sailing and tourism. Today, I am pleased however, not only to give that brief update on the work of our shipping registry, but to mark this momentous occasion in the evolution of our shipping registry. We believe the decision of SVITZER Americas to open a management office in the Territory, and to register their vessels under the British Virgin Islands flag is clear evidence that the Government of the Virgin Islands is moving in the right direction in the ship registration industry. With around 430 harbour and offshore tugs, SVITZER is the largest service provider in the world for towing vessels used in maritime operations. I understand that the center will manage the operations of approximately 70 tugs in the Americas. The Virgin Islands as an established and pioneering center for global business, secure and stable jurisdiction and a world renowned marine environment, is very conducive for establishing a shipping company. Furthermore, today is a welcomed development which highlights the value added services and benefits which continue to be derived from our financial services industry. We are delighted to associate with a world renowned company such as SVITZER and are happy to note that SVITZER has committed to bringing more vessels to be registered with the BVI. Work to bring the second vessel STATIA CORONI into the Virgin Island Register has already commenced. All good news! I commend the work of the Acting Director of the Virgin Islands Shipping Registry Captain Raman Bala and his team at the Shipping Registry for coordinating and making this event possible. Ladies and gentlemen, today progress continues. Mr. Snoei, I am indeed pleased to officially welcome SVITZER to the Territory, we thank you for choosing BVI as your flag and we look forward to a long lasting partnership with the company.